Fig.2 Graphical representation of intensity of various light sources across their life span. Fig.4 shows the logarithmic plots of the spectra of an excitation filter and emission filter commonly used for imaging GFP. The plots overlap between the optical densities of 6 of 7, giving sufficient overlap to ensure that excitation light does not pass through the emission filter. 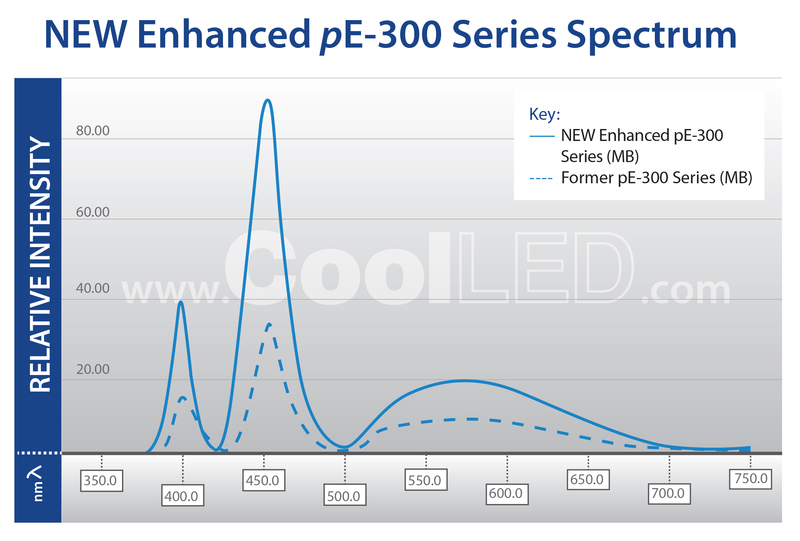 Fig.5 shows the spectral output of the CoolLED pE-300 Series, with includes one UV LED (365nm or 400nm), Blue (460nm) and a broad GYR LED. Fig. 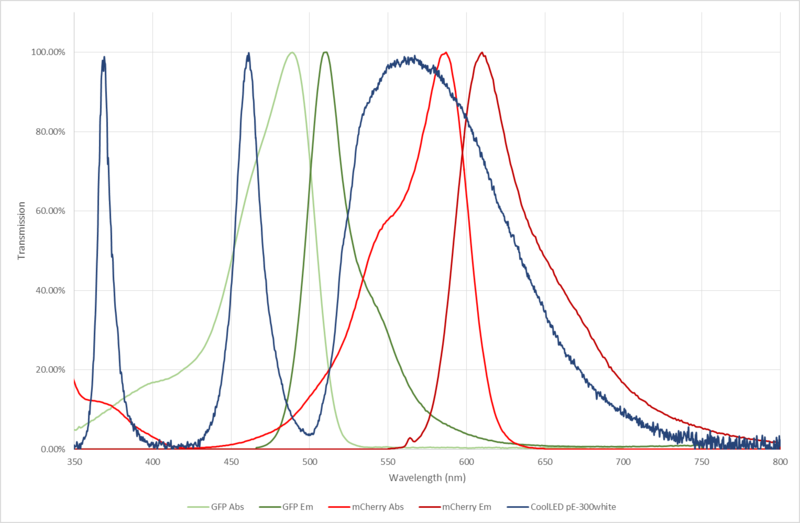 6 shows the excitation and emission spectra of GFP and mCherry, along with the emission spectra of the CoolLED pE-300white. Without the use of excitation and emission filters, the emission light of GFP will excite the mCherry fluorophore, causing cross talk. The discovery and development of fluorescent molecules for use in scientific imaging has been hugely important for the advancement of a number of research fields, including biology and material sciences. The increase in use of fluorescence imaging techniques has led a drive to improve light source technology. Traditional mercury and halide lamps are being replaced by new LED light sources that provide experimental, practical and environmental benefits. At the same time, this is pushing optical filter companies to create a broader range of filters, optimised for individual fluorescence molecules and LED wavelengths. However, optical filters can be confusing and many experiments are conducted without the correct filter configuration. This can lead to experimental conditions that are suboptimal and results that are inaccurate. This paper seeks to explain the purpose and benefits of optimal LED filtering. Traditionally, mercury and metal halide bulb light sources have been used for fluorescence microscopy. They are broadband, white, light sources, with multiple peaks of high intensity radiation from ultraviolet (UV), across the visible spectrum and into the near infrared (IR) (Figure 1). When new fluorescence molecules were initially developed, they were designed with these intensity peaks in mind in order to get maximum levels of fluorescence signal from the sample. Whilst they are bright, these light sources have their problems: bulbs frequently needed replacing and aligning, they are not environmentally friendly, they can be hazardous to change, control of light intensity is difficult, they cannot be switched on and off quickly, their intensity declines over the lifetime of the bulb and they emit high levels of heat. As LED technology became increasingly powerful, manufacturers began to realise that they could provide a much needed alternative for fluorescence imaging illumination. LEDs provide narrow bandwidth illumination and previously there were not enough available LEDs to cover the full visible spectrum. In addition to this, the LEDs that were available were not bright enough for fluorescence imaging. This meant that LEDs were not able to provide a suitable replacement for mercury or metal halide bulbs. However, with improvements in technology, there is now a large number of powerful LEDs that cover the spectrum from the UV across the visible range and into the IR. This means that regions of the spectrum in which mercury and metal halide lamps do illuminate strongly can now be illuminated by LEDs. This has also made way for the development of new fluorescent molecules that are no longer dependent on the emission spectrum of a mercury bulb. The introduction of LEDs into the world of fluorescence imaging has also brought about many additional advantages. Firstly, they can be much more easily controlled than traditional mercury or metal halide lamps. They can be switched on and off with millisecond timing precision, which removes the need for a mechanical shutter and improves the temporal resolution of experiments. Secondly, where a mercury/metal halide lamp would need to be left on for a days’ worth of experiments, LEDs can be switched off easily when not in use. This reduces energy consumption. In addition to this LEDs are more energy efficient and emit much less heat. Thirdly, their intensity can be electronically controlled, which removes the need for neutral density filters. Fourthly, mercury bulbs last approximately 300 hours, with a decline in intensity over their lifetime. They also require specialist disposal due to the high pressure blub and mercury content. 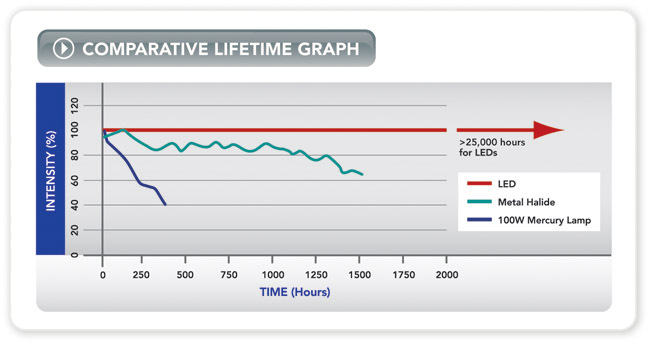 In contrast, LEDs last upwards of 25,000 hours without any drop in intensity (Figure 2). Finally, the tricky alignment required after frequently replacing bulbs is no longer needed. LEDs can be factory aligned and are ready to be fitted to the microscopy without complicated alignment procedures. The fact that LEDs illuminate in narrow bandwidths allows for ultimate flexibility when choosing a light source. Many manufacturers provide multiple solutions, from single wavelength light sources to sources combining multiple LEDS to cover the full visible spectrum. This is where optimal filtering becomes essential and where LED technology really comes into its own. Let us consider the most basic example, where a user is only interested in one fluorophore, such as GFP. The user can purchase a single LED solution centred at 470nm, such as the CoolLED pE-100 470nm. Figure 3 shows the emission of the LED and the excitation/emission spectra of GFP. The filter cube in the microscope holds the dichoric that will determine which wavelengths are reflected towards the sample. In this case, illustrated in figure 3, everything shorter than ~495nm will be reflected towards the sample. The light from the LED, will then hit the sample, causing molecules to fluoresce. The emitted fluorescence light will travel through the objective, be transmitted through the dichoric, and directed to the detector, usually the eye or a camera. It is important to note however that the dichoric does not provide a perfect block. Some wavelengths over 495nm will be reflected from the dichroic towards the sample. As figure 3 shows, this crosses over into the emission spectra of the fluorophore. If not blocked, this can be reflected back to the detector and add background noise to the image. To prevent this an excitation filter is placed in the microscope filter cube, in the path of the LED excitation light. This bandpass excitation filter, matched to excitation spectra of the fluorophore, will ensure that only the desired wavelengths reach the dichoric and are reflected towards the sample. An emission filter is also required, to ensure that only the wavelengths emitted by the fluorophore reach the detector. This will stop natural fluorescence emission from the sample (auto-fluorescence) and, stray light from the room or reflected LED light, from reaching the detector. Without the emission filter, all of these sources will add additional background noise to the image, reducing the image quality and making it harder to see the fluorescence signal. In this case of single fluorophore imaging, the emission filter can be placed in the filter cube of the microscope. This can be a bandpass filter, tailored to the emission of the fluorophore or a long pass emission filter letting through any light over a certain wavelength. Here a compromise is made between maximising fluorescence signal and minimising background noise. Whilst it is important to select filters to maximise fluorescence signal, careful attention must also be paid to the steepness of the filter edge and any crossover between the excitation filter and the emission filter. 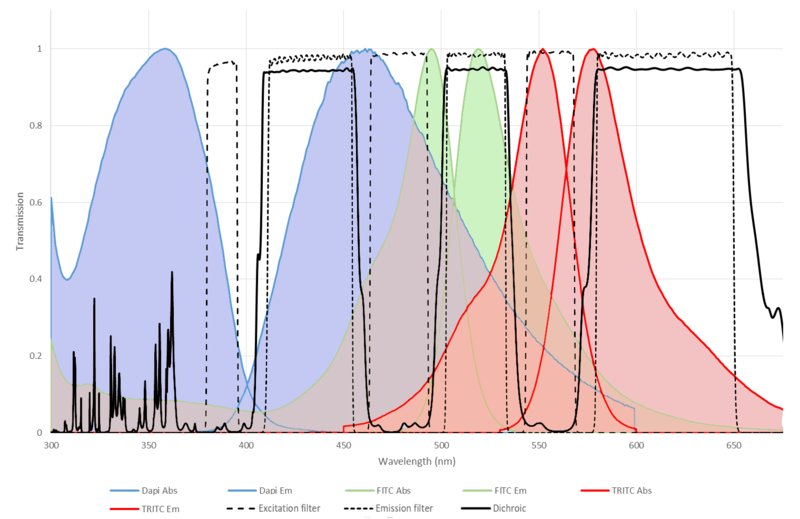 To ensure that there is sufficient separation of the two filters and that excitation light does not pass through the emission filter, filter manufacturers will allow you to plot the optical density (OD) of the spectra of each filter. For optimal separation, with minimal cross over and background noise, the filters should intersect at an OD of 6 or higher. This means that 1x10-6 or only 1 millionth of the light will pass through the emission filter. Anything more than this will be detrimental to image quality. This is illustrated in Figure 4. 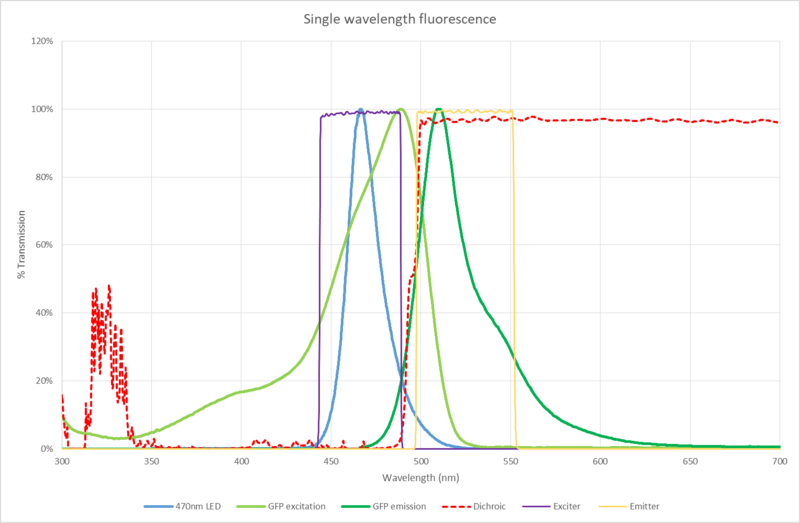 For users imaging multiple fluorophores there are a number of solutions and methods available. A light source that emits over a range of wavelengths will be required. In order to do this using LEDs, manufacturers typically combine a number of LED chips into one light source. This enables the user to illuminate samples stained with multiple dyes such as GFP and mCherry, or simply to use different dyes in different experiments. 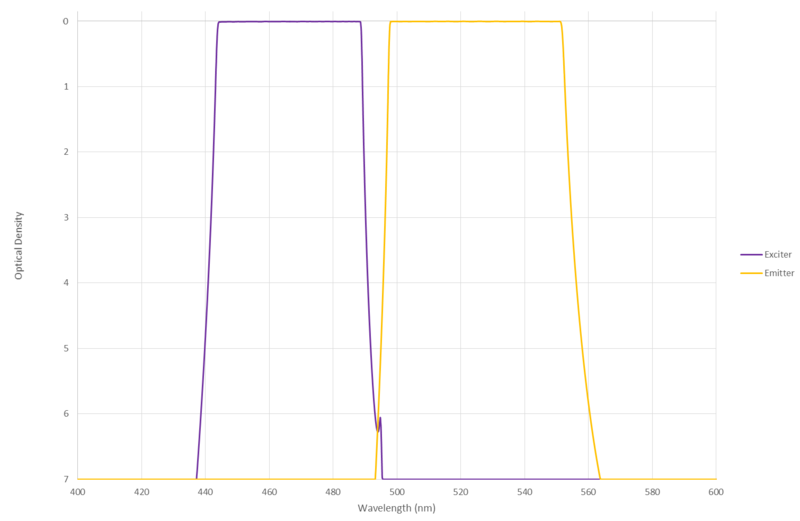 Figure 5 shows the emission spectra for CoolLED’s pE-300 Series, which combines a UV emitting LED with a Blue and a broader GYR LED, to give an overall ‘white’ output. For experiments requiring single wavelength imaging, or multicolour experiments that do not require high speed imaging, individual filter cubes for each fluorophore can be placed in the microscope, and selected manually as required or through use of a motorised filter turret. If a basic white LED light source is being used, for instance the pE-300lite, all three LEDs will illuminate at the same time. For this reason excitation filters are particularly important as they will block any wavelengths that will not excite the fluorophore. Whilst this is important for reducing background noise, it will have the added benefit of reducing sample photo-damage, as the sample is not being hit by unrequired excess light. Careful selection of emission filter is also important when multiple dyes are used in the same sample. 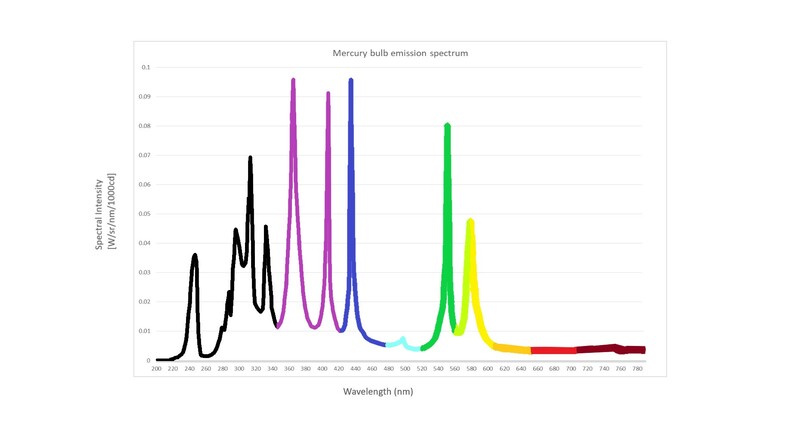 Figure 6 shows the emission and excitation spectra for GFP and mCherry. Here you can see a cross over in the emission spectra of GFP and excitation spectra of mCherry. The emitted fluorescence light from GFP will excite the mCherry fluorophore causing cross talk. However, with the correct emission filter, mCherry emission will be blocked and only light emitted from GFP will reach the detector. The user can then move the cube in the filter turret to the mCherry filter set and acquire an mCherry image. Once acquired, these images can be digitally combined to give a multicolour image. Single band filter sets are commonly used in fluorescence microscopy. However switching between filter cubes can cause pixel shift. This occurs when slight differences in alignment of the dichorics in each filter cube cause misalignment when the digitally combined images are overlapped. Shift of a single pixel or more can lead to aberrations in the final multi-fluorophore image and incorrect scientific interpretation of the results. Additionally, switching between filter cubes is slow and unsuitable for recording high speed cellular events. For this reason, multiband filter sets have been developed. These sets include an excitation filter, dichroic and emission filter that work for multiple fluorophores simultaneously. They work by blocking and transmitting specific wavelength bands, allowing the simultaneous acquisition of a multicolour image or rapid sequential imaging without the need to move filter cubes. Figure 7 shows the multiband filter set for DAPI, FITC, and TRITC. Whilst these fluorophores can be imaged simultaneously with a colour camera, this means that some of the more advanced monochrome technology cannot be used. Monochrome cameras provide the advantage of higher temporal and spatial resolution and have increased sensitivity. The combination of multiple wavelengths into one filter set will also give reduced optical separation which can lead to bleedthrough. In addition to this, the narrow bands of excitation and emission mean that the detected signals will not be as intense. Whilst necessary for some applications, this is not always the optimal solution. To improve image quality for multi-wavelength imaging, excitation and emission filter wheels can be used. With a multiband dichoric stationary in the microscope, the user can switch through excitation and emission filters, much faster than they would be able to move between individual filter cubes. These filter sets are often known as ‘Sedat’. Sequential images can then be acquired at high speed and combined using computer software. Whilst this is a good solution that minimises bleedthrough, there is still temporal separation between the images, which can result in image artefacts or simply missing high speed cellular events. Light source manufacturers took note of this problem and have developed light sources that allow the user to insert excitation filters directly in front of the individual LEDs. As many white light sources are constructed of a number of LEDs, for example the pE-300ultra (Figure 5), it is possible switch on and filter each LED individually. This means that no mechanical parts need to move when switching between wavelengths, as they can be controlled electronically. When this is used in combination with a multiband dichroic and emission filter, the speed of the experiment is limited only by the speed of the camera. High speed, high contrast sequential images can then be acquired and digitally combined without suffering from pixel shift. This approach provides the optimal solution for high speed live cell multicolour imaging, providing high contrast, without the need to purchase multiple emission filters or filter wheels. Filter manufacturers have introduced specialist ‘Pinkel’ multiband filter sets for this application, suitable for the most common combinations of fluorophores. LEDs have come a long way and now provide a superior solution to fluorescence imaging, with many advantages over traditional mercury or halogen light sources. However, as LEDs become more powerful and filter companies continue to develop better filters, understanding how best to optimise the experimental set up is key to obtaining the best results. Solutions such as the CoolLED pE-300ultra, pE- 340fura or pE-4000 utilise LED technology and allow the user to insert an excitation filter directly in front of each individual LED. For the pE-4000 they also provide dual filter holder that allows the user to easily mount and manually switch between two excitation filters per LED. This allows the user to easily change excitation filters when different fluorophores are being used, or to simply switch between different excitation filters in order to obtain maximum signal. Making use of these high end solutions means that filter set up can be easily optimised to achieve high contrast, high speed, multi fluorophore imaging, with accurate results and minimal light exposure to the sample.